From very early times India has been accessible to the West. The navies of Kings Hiram and Solomon possibly visited India; for it is stated that they brought back gold, silver, ivory, apes, and peacocks (I Kings x. 22). These are all Indian products, especially peacocks; and it is interesting to note that the Hebrew word for "peacock," "tukkiyyim," is of Dravidian origin. Caravans of Indian wares passed over the Palestinian frontier in ancient times. The Midianite merchants who purchased Joseph were importing spices, balm, and myrrh. The Jews of India comprise both Whites and Blacks: the former being racially pure; the latter, of mixed descent. 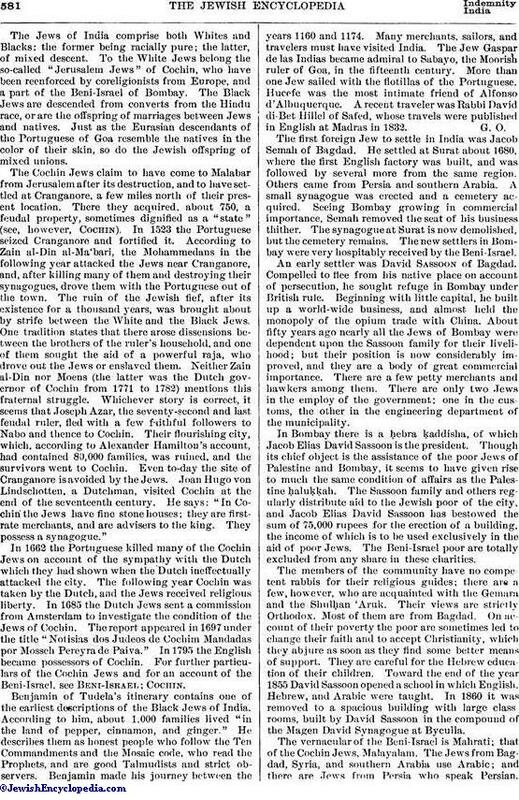 To the White Jews belong the so-called "Jerusalem Jews" of Cochin, who have been reenforced by coreligionists from Europe, and a part of the Beni-Israel of Bombay. The Black Jews are descended from converts from the Hindu- race, or are the offspring of marriages between Jews and natives. Just as the Eurasian descendants of the Portuguese of Goa resemble the natives in the color of their skin, so do the Jewish offspring of mixed unions. The Cochin Jews claim to have come to Malabar from Jerusalem after its destruction, and to have settled at Cranganore, a few miles north of their present location. There they acquired, about 750, a feudal property, sometimes dignified as a "state" (see, however, Cochin). In 1523 the Portuguese seized Cranganore and fortified it. According to Zain al-Din al-Ma'bari, the Mohammedans in the following year attacked the Jews near Cranganore, and, after killing many of them and destroying their synagogues, drove them with the Portuguese out of the town. The ruin of the Jewish fief, after its existence for a thousand years, was brought about by strife between the White and the Black Jews. One tradition states that there arose dissensions between the brothers of the ruler's household, and one of them sought the aid of a powerful raja, who drove out the Jews or enslaved them. Neither Zain al-Din nor Moens (the latter was the Dutch governor of Cochin from 1771 to 1782) mentions this fraternal struggle. Whichever story is correct, it seems that Joseph Azar, the seventy-second and last feudal ruler, fled with a few faithful followers to Nabo and thence to Cochin. Their flourishing city, which, according to Alexander Hamilton's account, had contained 80,000 families, was ruined, and the survivors went to Cochin. Even to-day the site of Cranganore is avoided by the Jews. Joan Hugo von Lindschotten, a Dutchman, visited Cochin at the end of the seventeenth century. He says: "In Cochin the Jews have fine stone houses; they are first-rate merchants, and are advisers to the king. They possess a synagogue." In 1662 the Portuguese killed many of the Cochin Jews on account of the sympathy with the Dutch which they had shown when the Dutch ineffectually attacked the city. The following year Cochin was taken by the Dutch, and the Jews received religious liberty. In 1685 the Dutch Jews sent a commission from Amsterdam to investigate the condition of the Jews of Cochin. The report appeared in 1697 under the title "Notisias dos Judeos de Cochin Mandadas por Mosseh Pereyra de Paiva." In I795 the English became possessors of Cochin. 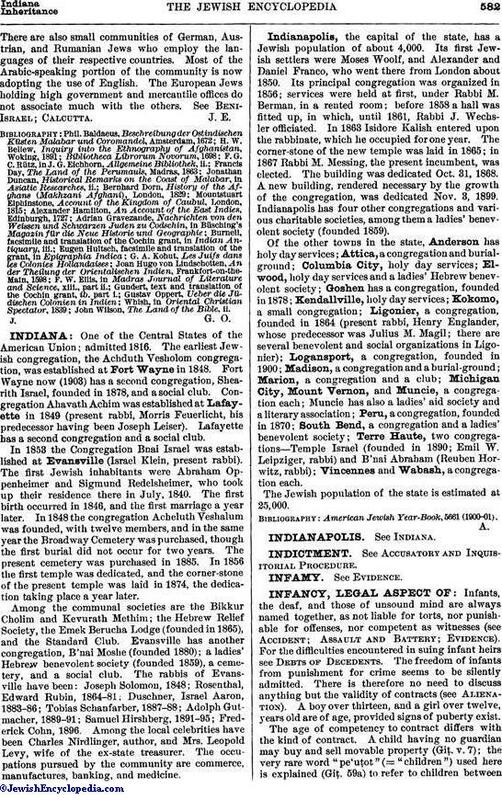 For further particulars of the Cochin Jews and for an account of the Beni-Israel, see Beni-Israel; Cochin. Benjamin of Tudela's itinerary contains one of the earliest descriptions of the Black Jews of India. According to him, about 1,000 families lived "in the land of pepper, cinnamon, and ginger." He describes them as honest people who follow the Ten Commandments and the Mosaic code, who read the Prophets, and are good Talmudists and strict observers. Benjamin made his journey between the years 1160 and 1174. Many merchants, sailors, and travelers must have visited India. The Jew Gaspar de las Indias became admiral to Sabayo, the Moorish ruler of Goa, in the fifteenth century. More than one Jew sailed with the flotillas of the Portuguese. Hucefe was the most intimate friend of Alfonso d'Albuquerque. A recent traveler was Rabbi David di-Bet Hillel of Safed, whose travels were published in English at Madras in 1832. The first foreign Jew to settle in India was Jacob Semah of Bagdad. He settled at Surat about 1680, where the first English factory was built, and was followed by several more from the same region. Others came from Persia and southern Arabia. A small synagogue was erected and a cemetery acquired. Seeing Bombay growing in commercial importance, Semah removed the seat of his business thither. The synagogue at Surat is now demolished, but the cemetery remains. The new settlers in Bombay were very hospitably received by the Beni-Israel. An early settler was David Sassoon of Bagdad. Compelled to flee from his native place on account of persecution, he sought refuge in Bombay under British rule. Beginning with little capital, he built up a world-wide business, and almost held the monopoly of the opium trade with China. About fifty years ago nearly all the Jews of Bombay were dependent upon the Sassoon family for their livelihood; but their position is now considerably improved, and they are a body of great commercial importance. There are a few petty merchants and hawkers among them. There are only two Jews in the employ of the government: one in the customs, the other in the engineering department of the municipality. In Bombay there is a ḥebra ḳaddisha, of which Jacob Elias David Sassoon is the president. Though its chief object is the assistance of the poor Jews of Palestine and Bombay, it seems to have given rise to much the same condition of affairs as the Palestine ḥaluḳḳah. 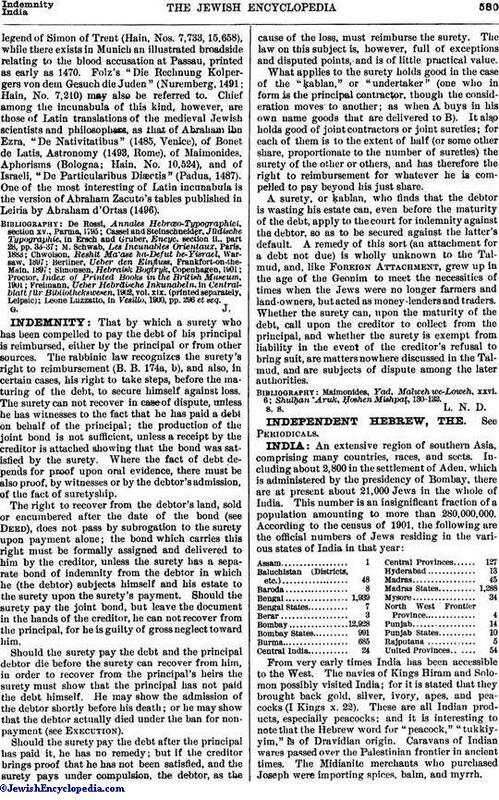 The Sassoon family and others regularly distribute aid to the Jewish poor of the city, and Jacob Elias David Sassoon has bestowed the sum of 75,000 rupees for the erection of a building, the income of which is to be used exclusively in the aid of poor Jews. The Beni-Israel poor are totally excluded from any share in these charities. The members of the community have no competent rabbis for their religious guides; there are a few, however, who are acquainted with the Gemara and the Shulḥan 'Aruk. Their views are strictly Orthodox. Most of them are from Bagdad. On account of their poverty the poor are sometimes led to change their faith and to accept Christianity, which they abjure as soon as they find some better means of support. They are careful for the Hebrew education of their children. Toward the end of the year 1855 David Sassoon opened a school in which English, Hebrew, and Arabic were taught. In 1860 it was removed to a spacious building with large classrooms, built by David Sassoon in the compound of the Magen David Synagogue at Byculla. The vernacular of the Beni-Israel is Mahrati; that of the Cochin Jews, Malayalam. The Jews from Bagdad, Syria, and southern Arabia use Arabic; and there are Jews from Persia who speak Persian.There are also small communities of German, Austrian, and Rumanian Jews who employ the languages of their respective countries. Most of the Arabic-speaking portion of the community is now adopting the use of English. The European Jews holding high government and mercantile offices do not associate much with the others. See Beni-Israel; Calcutta. John Wilson, The Land of the Bible. ii.